In the plaza by my house is an extremely large statue of a man, Eduardo Avaroa. He is a Bolivian military leader. But unlike most other countries, that put their war heroes in gallant poses- on top large warhorses, swords extended, showing how they will conquer all foes- Eduardo Avaroa is fallen to the ground, his rife laying on the ground. And also, in contrast to most other nations in the world who try to write their military defeats out of the history books, the Bolivians seem to have no problem celebrating a major military defeat. Hence Plaza Avaroa and Dia del Mar (Day of the Sea). 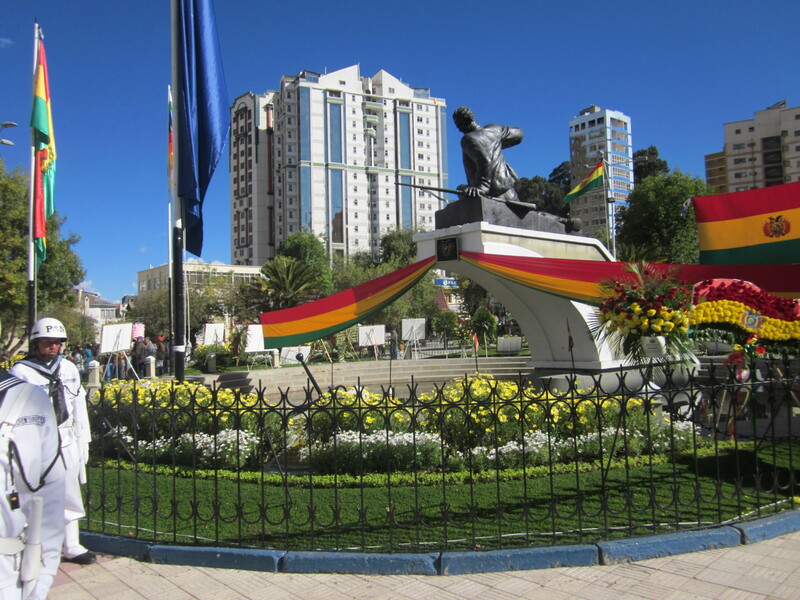 Now for those of you who aren’t so fresh on your 5th geography class, Bolivia has no sea. It is completely landlocked. But, you know kids, it wasn’t always this way. In 1879 Bolivia lost its coastline to Chile, which poor Eduardo Avaroa died trying to prevent, and the event which Dia del Mar is commemorates. Now, its been 132 years. Yes it was a pretty bitter loss with major political and economic implications (although the Chileans did build a tariff-free railroad and give Bolivia free port access – a consolation prize of sorts), but still, you think that they would want to move forward and stop reliving that unpleasant moment in history. But no. So much like children in the US learn Yankee Doodle about Paul Revere, every small Bolivian child in school learns patriotic songs about losing the ocean. Really, its built into their official curriculum. And every March 23rd, Plaza Avaroa is packed full of parading military units, army bands, complete with speeches from Navy admirals. Yes the navy. Apparently not wanting to be caught off-guard for the day when they once again have an ocean, Bolivia maintains a working navy, which patrols and has its own naval base on Lake Titicaca. It was quite the impressive event. The president, Evo Morales, was even there. He walked by in the official procession so close that I could have hit him with a paper airplane. 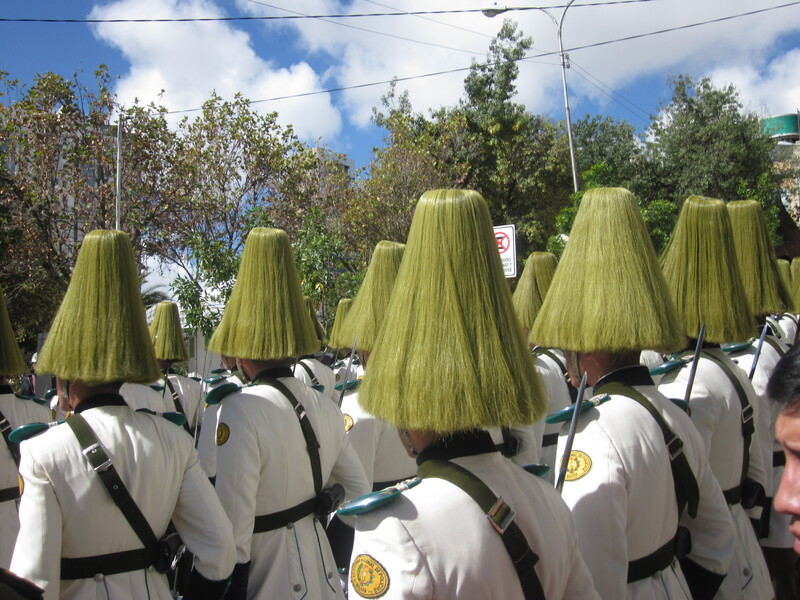 I suppose the Bolivian secret service isn’t too worried. 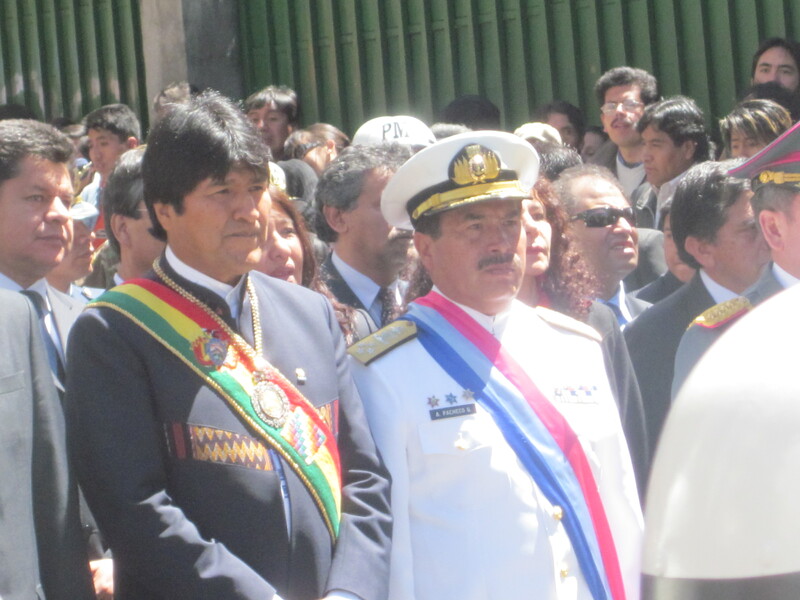 He and the other officials made grand speeches how Bolivia has the right to the sea and one day they will have it back. There is talk of taking Chile to court and suing them for it. If Mexico every wants to sue us for Texas, I say let them have it.